Oriente is the most eastern side of Cuba, the limits with Camagüey to the west, for the north the Old Channel of the Bahamas; for the east with the Step of Winds that separates it of the island La Española (Haiti and Dominican Republic); for the south the Sea of Antilles; and for the west the Guacanayabo Gulf wich is part of the Sea of Antilles. Since Diego Velásquez arrived to Cuba up to 1607, the whole island was considered a single political entity, all the villages responding to the governor of Cuba. With the course of the time left the island was dividing in jurisdictions. In 1827 settled a system of three divisions for the island. 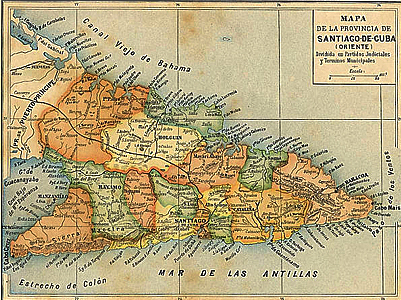 In June 9 of 1878 the island of Cuba was divided in six provinces this measure was taken to be able to choose the deputies that would represent Cuba in the Spanish Government. As part of this new organization el Oriente de Cuba was divided in parties. During the American Military Government of the (1899-1902) and the first years of the New Republic the political division of Cuba was changed. Many of the municipal terms being incorporate to bigger population's neighboring municipalities. In 1978 a new division was made from the provinces to those that a new restructuring of the municipalities was assigned. One century after the creation of the six traditional provinces, the current government revolutionary passed a law subdividing el Oriente de Cuba in following provinces: Las Tunas, Granma, Holguín, Santiago de Cuba and Guantánamo. The Agriculture of el Oriente de Cuba has been developed in a substantial way. 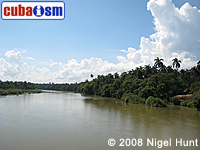 This region is shown like a source of agricultural supply, where the main cultivations are coffee and cocoa. El Oriente de Cuba and their people are cheerful and hospital given to their culture a combination of strange traditions. The Industry has the nickel, which is one the main link of the cuban economy. 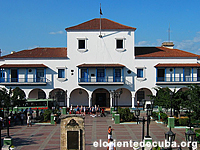 El Oriente de Cuba has 6 Important Cities: Santiago from Cuba, Holguín, Guantánamo, Baracoa, Bayamo and The Tunas; each one of them with peculiarities that highlight them inside this region ... more info. Great number of beaches and exotic places highlight the Tourism of el Oriente de Cuba as one of the best ecotourism destination in the Caribbean. Museums, squares, forests, parks and nonpareil monuments give a characteristic distinction touch to this region which constitutes a fundamental attraction to the International Tourism. ... more info. 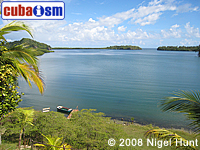 Oriente de Cuba is distinguished to be the most mountainous region in Cuba. The climate is tropical with rain in summer, and the natural vegetation of mixed forest is conserved mainly in the mountainous regions ... more info. 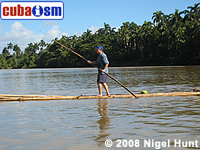 Nature in el Oriente de Cuba is in perfect state of conservation . Big extensions densely covered by forests, the wooden biggest reservations in Cuba. Beautiful landscapes fundamentally in the Biosphere Reserve Cuchillas del Toa, which main part is the National Park Alejandro Humboldt ... more info.